Ugh, How Annoying Is My Husband? Tell me it’s not the most annoying thing in the world when your husband is better than you are at basically everything in the world. And, isn’t it even more annoying when you bring this up to him and he chuckles and good naturedly shakes his head, then tells you it’s not true and that you, in fact, are the wonderful one, and then he gives you a sweet kiss on the mouth? Gag. Ok, I’m not competitive or anything but I made a list of things Florian is better at than I am. Parking. Well, driving in general, but specifically Florian can reverse into a spot where the parking lot is like a can or sardines. On the first try. And did I mention that he drives a Mom-style station wagon boat car? Playing Tennis. That’s right ladies and gentlemen, my husband is a dream killer. I was supposed to move to Switzerland and become a Country Club housewife and learn how to play fantastic tennis. Well, today was supposed to be my first lesson but I have a sinus infection so I asked Florian to take my lesson. Florian, who “hasn’t picked up a racket in 4 or 5 years” nailed every backhand, forehand, and serve he attempted. I don’t actually know how to hold a racket yet. Being Patient. I’m American, so it’s implied that I am going to want what I want, when I want it. Florian can sit for hours without losing his cool, whether he’s battling my naggy lectures or forcing our dog Bella to take her medicine. His ingenious plan is simply to wait out his foe until we quit from exhaustion or boredom and he gets what he wants. I don’t even have the patience to try and reverse this tactic on him, even once. Painting my fingernails. Sad but true. When I paint my own nails, I manage to get it all over the sides and tips of my finger, effectively painting my entire finger in the process of painting the nail. But Florian, who wanted to be a good husband and asked his sister to teach him how to paint nails correctly for me, even has the patience to sand and buff my nails before pushing back the cuticles and putting on the undercoat. This goes back to point 3, Florian wins on patience. He’ll spend a good 45 minutes on my nails to get them perfect. Directions.When Florian used to visit me in San Diego, where I had lived for 5 years, he would give me directions to places, some of which were ones he remembered because he’d “been there once or twice” yearsago! In fairness, I basically get lost in a cardboard box and can never give directions even to my own home so almost everyone is better at it than I am, but I think Florian could sweep the floor with even talented people in this department. But my parents always told me I was special and everybody has some good qualities, right? So, here’s the list of things I’m better at than Florian. Speaking English. Yep, that’s right, native mother freakin’ tongue English!! You’ll never hear me say phrases like “Let’s make a party!” or “I didn’t knowed that”. Nope, I speak correct, fluent English. With commas in the correct places. However I do, as my older brother Mike often likes to point out, occasionally use the word ironic incorrectly. I blame Alanis Morisette for teaching the 11-year-old Lisa its incorrect usage. Watering plants. Florian is a cactus murderer. I, on the other hand, have a Golden Thumb and have cultivated an olive tree, orchids, an unknown tree-leafy thing, and several kinds of herbs. RIP Basil the Second, you and your brother Basil the First (whom I also killed) will be missed. Picking up strangers at a bar. Maybe not such a useful skill these days, being a married woman and all, but Florian and I never would have met if I hadn’t leaned over at Fluxx that fateful July evening and commented on the bargirl’s outfit. Since we’re married now, I’m going to count that as an essential skill, and I’m the undisputed champion of it since Florian was so shy when we first talked that he literally looked around to see if I was talking to someone else because he couldn’t figure out why I was talking to him. Paying attention when other people talk. Or, at least better at pretending to pay attention when other people talk. Florian nods and says “um hmmm”, but since I’m onto his game, I don’t say things that require a yes response. I purposely phrase my questions so that it involves an actual answer, and therefore trap him when he isn’t listening. He can never trap me when I’m not listening because I learned how to multi-task when I was 12. Sidenote: Florian is just clever enough that he listens and makes sure he does not agree when he hears key danger words “new Prada purse” or “Jimmy Choo shoes”, so it’s not even like I can take advantage of his self-induced hearing loss! Being a Girl. I shriek louder when I see a spider, I think more things are yucky, and I wear skirts. 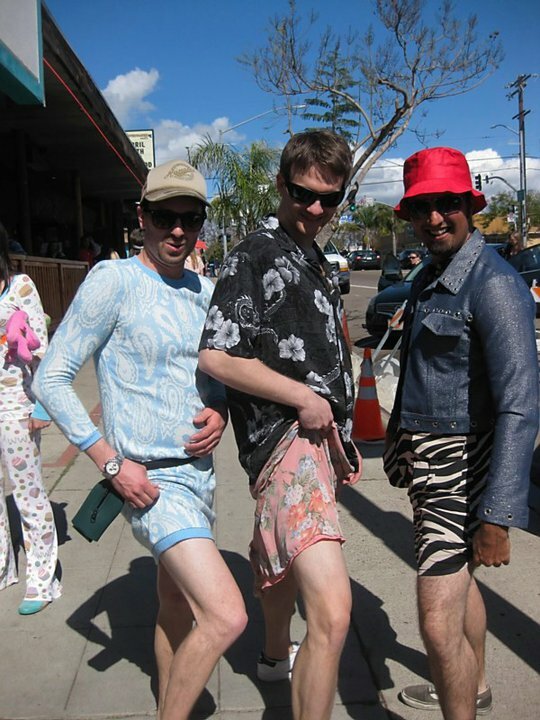 Oh wait, Florian wears skirts too, as evidenced by the picture below. Does that make him a better girl? Actually wait, I have the quintessential girl characteristic nailed down – I’m brilliant at being passive aggressive! Take this blog for example: I’m annoyed at Florian for being great so I am including an embarrassing picture of him, and yet I worked it into my blog to make it seem like it was inserted only because it fit the blog entry. See, I win passive-aggressive!